The year 2018 has not been a great one for the food world. 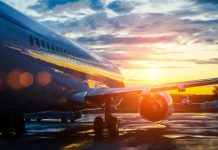 There was the loss of two of the brightest people in the business, Anthony Bourdain and the Pulitzer Prize-winning Los Angeles critic Jonathan Gold. Likewise, it was hard to find one new, unifying restaurant that captured everyone’s imagination. That doesn’t mean there weren’t captivating dishes. In fact, these 16 were positively remarkable. They run the gamut from just-caught king salmon in Alaska to exquisitely aged Irish beef in London. There’s a lot of bread—it was, after all, the 2017 dish of the year and still looming large—but no noodles. New York introduced two places you’d assume would make the cut: Missy Robbins’s pasta-focused Misi followed her breakout, Lilia, and David Chang reimagined ramen at the new Momofuku. Yet different dishes stood out more on their menus instead. To find out what those dishes are, and the 14 other most outstanding ones, read on. And grab a snack while you’re at it—you’re going to get hungry. Unlike most dishes that feature a dollop of caviar, what grabs your attention with this exquisite Korean omakase counter’s cooked vegetable course is not the pricey fish roe. 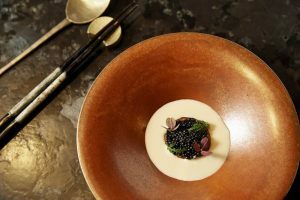 Chef-owner Junghyun Park layers tender celery root on a bed of fresh, yogurtlike buttermilk cheese—and adds the caviar, sure. But then comes the unforgettable component: creamy, softly sweet hazelnut sauce that Park pours over it all to finish the dish. It balances the saline pop of caviar, the silkiness of the celery root, and the tang from the cheese. Whole Roast Duck With Duck Confit Salad | Spoken English, Washington, D.C. This small, standing-room-only restaurant (literally) is hidden in the groovy Line hotel, a new D.C. hotspot that once was a church. The dining room consists of two short counters, which are an extension of the kitchen; it’s like snacking at a friend’s house. 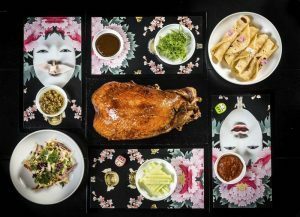 On the menu are twisted classics such as chicken skin dumplings from chefs Erik Bruner Yang and Matthew Crowley, as well as the best duck I ate this year—a time when there’s been a lot of good duck out there. Here it’s cured in tea for four to five days before being roasted over wood and carved up. The legs are confited and tossed into a salad, the breast is thickly sliced, and the supple tortillas to roll it all up in are made with duck fat instead of lard. A few years ago at Lilia, chef Missy Robbins made a long, curly stretch of malfadini noodle with buttery pink peppercorns New York’s most sought-after dish. At her new place, Misi, in the southern reaches of Brooklyn’s Williamsburg neighborhood, the best thing isn’t pasta but oven-blasted tomatoes. Roasting for a couple of hours intensifies their sweetness, which is then hit with a drizzle of Calabrian chile-infused honey, further punching up the shriveled halves. A licorice bite from the cracked coriander seeds and fennel, tucked into the oil, takes it over the top. Forget lobster and oysters. The local bluefin tuna belly that Jordan Rubin gets in late summer and the fall is the seafood standout in Portland, Maine. In mid-2017, Rubin bought a hot dog cart and started making hand rolls and sushi burritos on the downtown streets. His operation quickly grew into a mini food truck empire that now includes a space in the Portland Public Market. The hand roll’s nori wrapper is notably crisp because Rubin keeps it warmed in an electric toaster before wrapping it around tangy rice and fatty, melt-in-your-mouth chopped fish mixed with sea salt, scallions, and potent fresh wasabi sauce. 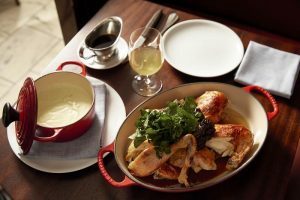 Twenty years ago the roast chicken at Balthazar, carved tableside, made the bird chic in Manhattan. Now the chefs who helped put it on the map there—Lee Hanson and Riad Nasr—have reintroduced it at their beyond-buzzy Frenchette. Not simply a vehicle for crispy skin, it’s a superbly juicy and supple bird served in a shallow casserole. Standing alongside is a separate pot of pommes purée that’s approximately half butter, and often garnished with roasted maitake mushrooms, giving you all the earthy flavors on one table. For those who think they never want to eat panna cotta again, it’s time you taste the triangular wedge at Columbia Street’s cult favorite wine bar, where it’s served as if it were a cake. The custard is infused with piquant cardamom and topped with charred orange slices that offset the sweetness. 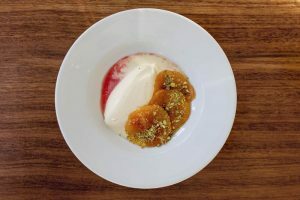 But the beauty of this dish is the rich double cream that chef-owner Ed Wilson sources to make it, lending a texture that’s not too gummy, not too loose—just perfect, like the best ice cream made ever-so-slightly more solid. At this spare new Scandi restaurant and wine bar, chefs Will Gleave and Peppe Belvedere rely on their neighbors—specifically the great local butcher shop, Hill & Szork. They take Irish sirloin that’s been aged at the shop for 45 days (there’s not enough room at Bright to age it themselves) and then grind it with funky aged beef fat and salt, pepper, and paprika. It’s served on sourdough toast brushed with more of the fat, then topped with capers and chives macerated with elderberry. It’s the platonic ideal of beef tartare. Valerie Gordon may have gained notoriety for her chocolate bars, now a common sight at coffee shops across the country, with their bold packaging and flavors such as salt and pepper with crispy rice. But the real standout of her eponymous confectionary are the classic desserts she re-creates out of fear they’re fading into oblivion. 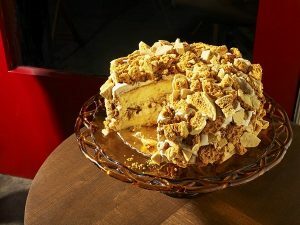 Blum’s cake is an architectural masterpiece, studded with shards of chewy, coffee-infused honeycomb that superbly contrast the coffee whipped cream oozing out between layers of tender yellow cake. 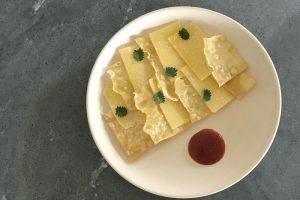 The deceptively simple dish at Michelin-starred restaurant Elske has just three components: cheese, jam, and crackers. The cheese is Wilde Weide, a two-year-old aged raw cow gouda with crystallized streaks. The jam is vanilla-infused tomato dolloped into a nest. And the crackers are made from a yeasted dough that’s doused in olive oil before baking, which gives them a superbly flaky, buttery texture, like a French pastry you didn’t know existed. Together, they’re unstoppable. 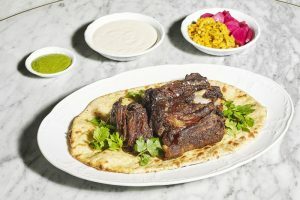 Among the slew of promising new Middle Eastern restaurants across the U.S. is the greenery-filled Bavel in downtown L.A. Ori Menashe takes an underused cut—lamb neck—and coats it with a paste of tangy sumac and caramelized onions. The meat is roasted for hours until falling-apart tender, and the rub is baked in. 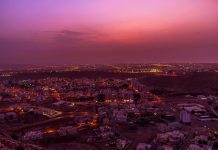 It’s served with an array of sides including pickled vegetables and creamy house-made tahini, as well as the flatbreads for which the restaurant has rightly become famous. David Chang is on a mission to get you to eat the whole shrimp—shell, head, all of it. To accomplish this, he and his crack chef team of Tony Kim, Matthew Rudofker, and J.J. Basil have created a scintillatingly spicy coating at the new Noodle Bar in the Shops at Columbus Circle, aka the Time Warner Center. 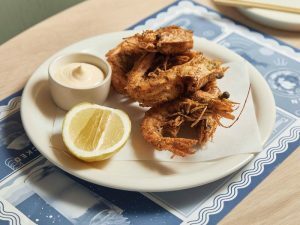 A blend of cumin, togarashi (the Japanese version of chili powder), sugar, salt, and Sichuan peppercorn is plastered onto the delicately fried shrimp, making it impossible not to eat the wafer-crisp shell along with the sweet meat inside. A spritz of lemon and an accompanying bowl of yuzu mayo cools it all down. 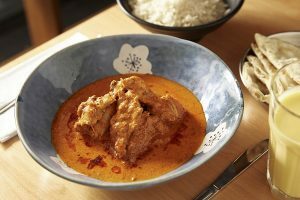 Normally, butter chicken is a forgettable staple of Indian takeaway. That all changes at the thrilling, no-frills Adda in Long Island City, Queens. The dish is recognizable only by name, and it makes you realize that all the versions you’ve had before are lame. The deep orange sauce is lit up with darkly sweet fenugreek, cardamom, cilantro root, and a generous hit of red chiles, making it much hotter than usual. 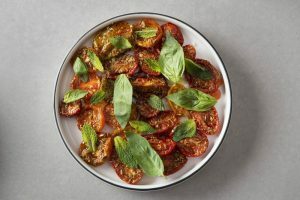 The biggest difference: the local tomatoes and honey that replace the standard canned tomatoes and sugar, lending the dish a punchy freshness that cuts through that classic slick of butter on top. Chef Beau Schooler of Juneau’s In Bocca al Lupo calls his dish simply “salmon offcuts,” which may be true, if perhaps a disservice to the quality of what you get on your plate: a combination of the collar, belly, tail, and head, depending on what was caught in the last 24 hours. There’s never a guarantee that he’ll have white king salmon, but if he does, order it. The incredibly fresh fish has a cleaner richness then common salmon. Salted and drizzled with olive oil, the fish gets popped into a wood-burning oven, right next to the coals, so the skin chars. 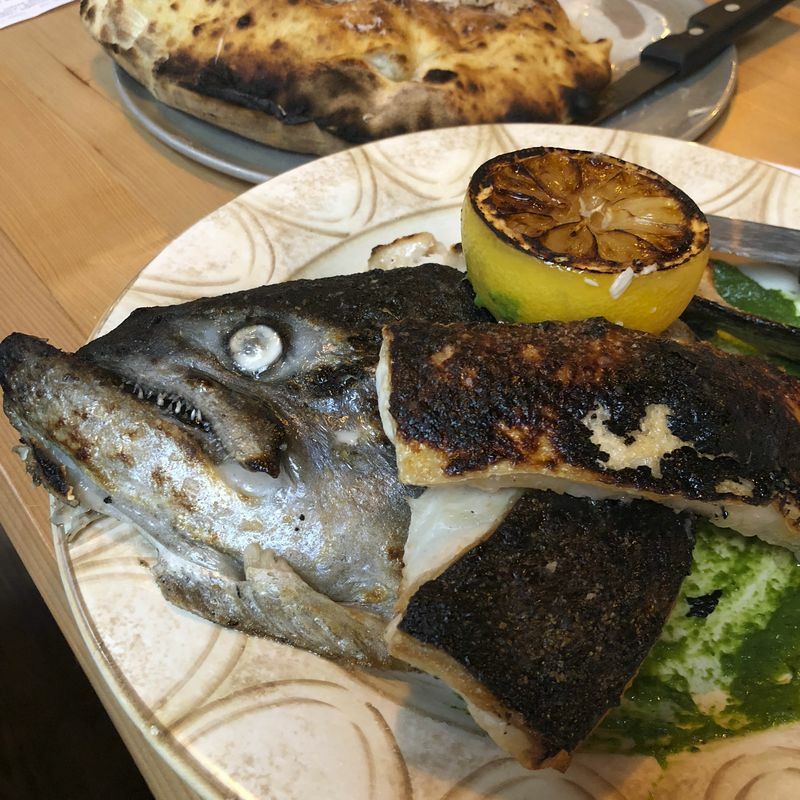 The accompaniment is an equally elemental charred lemon wedge, a garlicky parsley pesto that’s intensified with a blast of fish sauce, and a finishing sprinkle of Alaskan sea salt from Sitka. 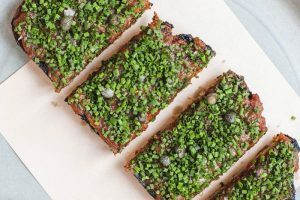 It’s been a big year for sandos in New York, the most high-profile being the $185 version of the Japanese sandwich made with wagyu beef. But pay attention to the one crafted by chef Greg Proechel at Ferris that costs about one-tenth the price. Made with succulent acorn-fed Spanish pork, about ¾-inch thick, it’s egged, breaded, and fried to medium rare so it’s crunchy but still supremely juicy. The toast is judiciously brushed with a fruity, hoisin sauce and is just thick enough to keep the cutlet secure. Pizza prince Anthony Mangieri figures he’s tried every buffalo mozzarella in the U.S. and half of the ones in Italy. 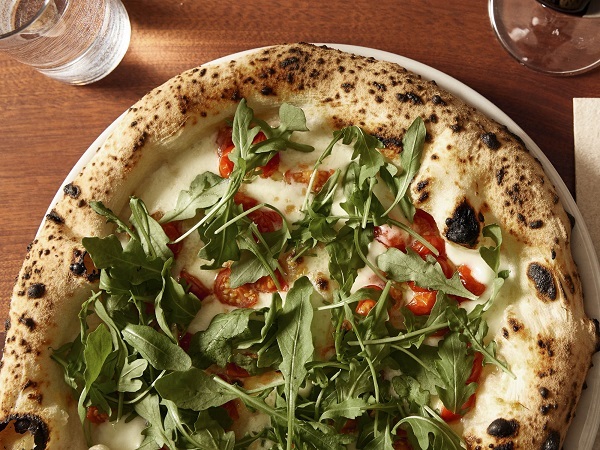 He came across his favorite outside Naples—it’s grassy and slightly animal-y—and along with that classic “mozz,” he brings in a quantity that’s been wood-smoked to star on Una Pizza Napoletana’s simple, standout pie. The Ilaria, named for his wife, is a doughy delight, like a lightly charred pillow. It features pools of that smoky mozzarella paired with the refreshing snap of cherry tomatoes and arugula.